I hate guilt. It consumes me and eats me up inside. Accepting my feelings of guilt, or rationalizing coping with them, or whatever is one of my biggest crosses to date. She said that guilt results from when you do something wrong. No. No way no how no no no. No no no nope no. I will take all the crappy things in the world because I have the best mom ever. I had a brain scan this week, and saw the neurosurgeon on Friday for the review. I was up super late last night going through the report with a fine-toothed comb. Just participated in a #BTSM (brain tumor social media) tweetchat. I had a terrible dizzy episode this morning right after I woke up. At church last week I had a horrible experience in teaching my Relief Society lesson. The connection between my brain and my mouth was lost. I couldn’t get the words out. I lost it in front of the sisters. I cried. I also had a good dinner with a friend Friday night. I bought some new shoes and a new workout top, too. I have done a lot of sudoku puzzles these last couple of months. Went to a zoo with my family. Usually, my brain stuff keeps me up at night, but what I continue to learn each day is that I have to balance my life and my health. I don’t do it well, and I don’t do it often. I just get to keep practicing. What in the world am I doing up this late? Oh, yeah. My anxiety is flaring. Big time. But I had a good day today. It started out well. I guess. During the 2nd hour of church I worked on some Family History. I have such a strong calling to search after my ancestors, and there is one line in my family where I am completely stuck. At a wall. Either this man saw a murder or he committed a murder and changed his last name in the process. Pretty crazy stuff. But I am committed to figure out, somehow, what happened and to find the rest of my ancestors. I taught the Relief Society lesson today also. It went very well. The Spirit was so strong, and the sisters were responsive and it was just a great discussion. I am so lucky. But. Here comes the gnarly part: I can’t deny that my brain is changing. And I don’t know what to do with this. My brain is changing and other things are changing too and it’s scaring the crap out of me. I am so saddled with grief that my only option is to take more medication to help manage my symptoms. Who knows how these symptoms will progress is another thing that scares the holy crap out of me, too. I guess I should be glad I had a good 3 years – and now I feel it’s all going downhill from here. I’m so scared. What do I do about my brain changing and my body changing? This dizzy crap that makes me feel like I’m going to fall over? And then what if I can’t drive anymore? It’s weird that these symptoms seemed to have come up from no where, if that makes sense. I have so much anxiety in my heart yet as I sit here to write it all out I’m blocked. I cannot seem to get it from my head to my fingers. I don’t know how to process these emotions of what’s going on inside of me. You know, my biggest fear (when I had the first surgery) was that when I woke up I was going to be different. And, by the grace of Heavenly Father I wasn’t. Yet, the brain is such an amazing thing I think I had no idea how magnificent it really is. So, as I sit here typing, I’m wondering, “What can I do to take care of my brain better?” Well, duh. Sleep would be job #1. But what else? I know there are tons of things out there about classical music and our brains – and I do listen to classical music quite often. I should really research this and look into this more…I’m afraid that my brain, or at least my cerebellum, is tired. Wouldn’t you be, too, after a freaking 13-hour long surgery?! I need to really take good care of it. This seems like a dream. This doesn’t seem real. Like, I don’t, or can’t, believe that I am the person who has 2 brain tumors, who had a hysterectomy, and will never be a mother, because of these 2 rare genetic conditions that I just found out about only 3 years ago. I guess looking at it that way, I’m only a toddler on this Rare Disease Road. And, toddlers need a lot of love and support. For the record, I want off the effing road, but I know that can’t happen. So with all this being written, I am going to go to bed. Turn on my iPod and listen to the Mormon Tabernacle Choir hymns and just sleep for tonight. I know I can live in fear or I can live in faith. These 2 emotions waiver minute by minute I’ve noticed. So, when I tip over into fear, I need to do something quickly to get back in faith. That’s why I jumped on here and wrote for a few minutes so I can clear my head. And to remember the great things about today. (Nephew #2 had me draw a name out of a plastic baggie because we are doing “Secret Santa” and it ended up that I drew my name!) 🙂 But, we fixed it after all. Did you watch that TLC show last weekend called The Secret Santa? So, we all think about bad things going on in our life. Right? It’s hard not to think about struggles, fears, unknowns. All of that. 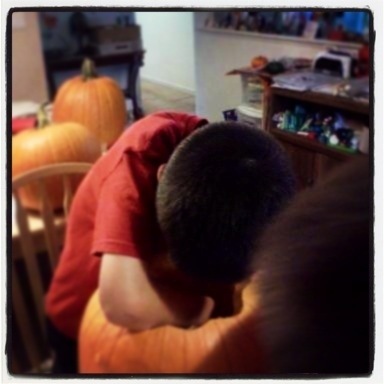 Part of the reason I have this blog is to get it all out…no filter here. My nephews who make my heart sing every day. When I hear them call me “Auntie”, I know I can do anything! My beanie baby “Max”, who I got years ago after my brother rescued a dog that he named Max. I loved this dog more than anything! This list isn’t all-inclusive. It’s a work in progress for sure! Dear Readers – what’s on your Good List? I thought about some funny titles for this post, “The Change of Life” or some such things. Today being Mother’s Day and all. It’s to write and be honest and raw. To be who I am whole-heartedly. To own that. To embrace me and all that I am. I’m never going to be a mother. I’m never going to have the miracle of life growing inside me. I will never able to look at another human being and know that I created that with a husband. Gone. Done. Not happening. Off the table. 5 months ago today I made the decision to have a hysterectomy. I have had huge things on my mind since the Lhermitte-duclos Disease and Cowden’s Syndrome diagnosis (colonoscopies, breast cancer, etc.) but “uterine cancer risk” was like a small gnat buzzing around my head. I couldn’t shake it! I knew I had to decide soon…but, I still hung on. It still took me a LONG time (most of 2012) to finally say with all assurance and the strength I could muster, “NOT GETTING UTERINE CANCER TRUMPS NOT HAVING CHILDREN.” Saying it, I get it. But feeling it? It’s a different story. PS: Hot flashes are the devil on earth and I pray for relief from them. One day. Sigh. PPS: Happy Mother’s Day Mom! I need more days like today. Went to see Rio 2 with mom and my nephews. Ate sushi and watched my nephews run around the park. Remember when you could just run, run, run, and run without a care in the world? I am so glad I got to experience today with my family. I tweeted this morning that I was looking forward to a NON Rare Disease day. Between the struggles of life that Cowden’s Syndrome and Lhermitte-duclos Disease bring me, I am thankful for any opportunity to lay it down. Now, I must get ready to tutor and get to a get to bed early because I am subbing tomorrow morning. It’s a nice change of pace to have some semblance of normalcy, and I know that I have to work on my thoughts of expecting good things to happen in my life, instead of waiting for the other shoe to drop. It’s been almost 3 years since I heard the phrases Cowden’s Syndrome and Lhermitte-duclos Disease, I know that. But, even after 3 years I don’t ever forget that I have 2 brain tumors, and that my life has completely done a 180. I must start expecting good things in my life, and not fear the bad. I know where this all stems from…the 5 cm. brain tumor completely rocked me to my core. How much longer will it take me to acclimate to it? Or is this the best it will be for me? Who knows. I just know that I am better than I was 3 years ago. That’s a great thing. That is progress. As I have written before, there’s no book titled Cowden’s Syndrome for Dummies. So, I didn’t get to read up about it after diagnosis. The neurosurgeon didn’t give me “LDD 101” after surgery. I guess for all intent and purpose, I’m not doing too bad. This is my life, without any instructions, and I’m plugging along as best I can. So, I am late again with this Fun Fact Friday. And, to be honest, I’m not sure how fun these facts are. 🙂 But, I am going to do a 2fer again since I was late in writing this post. My great-grandmother is the product of a union between 2 first cousins. In Ireland, back in the day, who knows what went on? Also, we also don’t know if one of the cousin’s parents was adopted. Many different scenarios could have played out. I have ancestors from Germany. This is very exciting news to me! 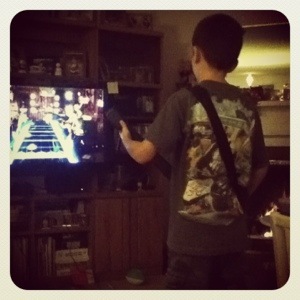 Nephew #1 loves Guitar Hero & I love cheering him on! He is definitely one of the many miracles in my life.